Dear Stephen, Is it safe to take Artemisia absinthium and cryptolepsis together? Dear Stephen, This weekend I had a taste of limoncello, the Italian liquer, and had a really strong herx afterwards. I understand that it's made by steeping lemon rinds in alcohol, so it contains lemon oils. Dear Stephen, Do you know how reliable PCR tests are for determining ending treatment for lyme and babesia? Dear Stephen, I discovered that I become quite sick if I take turmeric. The response is not immediate, but more like 12-48 hours after taking the turmeric. I become very weak and sick and feel toxic all over. Dear Stephen, My doctor says I have "thick" blood and should take nattokinase. Is there an overlap between the red root and nattokinase? Dear Stephen, What do you know about schisandra and it's use for the liver? My son is a Hepatitis B carrier (from birth in Korea) and is now on your basic protocol for lyme. Athletes with lyme: exercising okay? Dear Stephen, I am a former athlete who has used your herbal protocol off and on but wonder if exercising makes things worse or if it will help. 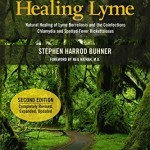 Dear Stephen, I have really bad interstitial cystitis and daily headaches which make treating my lyme really difficult. Do you have recommendations for the excruciating bladder pain I have? Dear Stephen, I have chronic lyme disease but one of my most problematic co-infections is strep bacteria. My LLMD thinks that the strep is actually my biggest problem right now. Increased babesia sweats – herx? Dear Stephen, I've been taking cryptolepis for babesia the past two weeks and I'm now having stronger sweats about twice a day. Is this a good thing? Dear Stephen, A few days into your herbal protocol for lyme I started feeling drunk and blurry within an hour of taking a a capsule. Any advice? Dear Stephen, Do any of these herbs in your core protocol cause issues for those of us who suffer from hypoglycemia? Dear Stephen, I was on your herbal protocol for about eight months. My energy and cognitive ability have improved, but I have a constant sinus issue, and am always congested in my nose and throat. Dear Stephen, I have very low levels of estrogen and progesterone, although my estrogen levels are higher. I am concerned about andrographis' potential effects on my progesterone levels. Dear Stephen, The fact that we need to build up to so many capsules is a bit daunting, in terms of the cost in the UK. Do you know of anywhere I could buy in bulk that would deliver here? Dear Stephen, If I were to do your core Lyme protocol—and I don’t have an active Lyme infection, just autoimmune disease (whatever that really means)—could any of the herbs be harmful? Dear Stephen, Can lyme biotoxins cause an elevated level of porphryins on a urine test?